The state tree of Florida is the palm tree, and it's no wonder considering how many palm species are cultivated throughout the state. 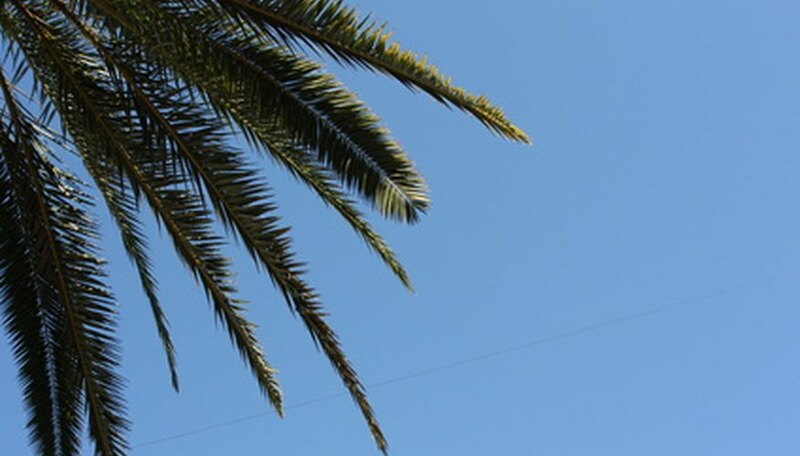 Almost all species of palms prefer temperate, subtropical or tropical climates, making them an icon of the tropics. Nicknamed "The Sunshine State," Florida is an ideal location for these sun-loving trees. The state tree of Florida, the cabbage palm (Sabal palmetto) is a tall-growing palm that can sometimes reach heights of 70 feet. Seen frequently throughout the state, the cabbage palm is native to the southeastern United States, as well as Cuba and the Bahamas. Cabbage palms boast long, narrow trunks topped off by green or yellow-green fronds. The tree produces columns of creamy yellow flowers, which give way to small fruits that attract wildlife. Cabbage palms can grow in a range of soil types and are drought-, frost- and salt-tolerant, making them excellent for coastal gardens. The tree should be planted in full sun for the healthiest result. The king palm tree (Archontophoenix cunninghamiana), also called the Bangalow palm, is a fast-growing palm native to Australia. The tree can reach an average height of 30 or 40 feet when mature, producing large deep green fronds. King palms exhibit lovely clusters of small pink flowers, which give way to charming red ornamental fruits.The king palm tree thrives in Florida, growing well in full sunlight with moist, well-drained soil. Producing distinct bushy fronds, the foxtail palm (Wodyetia bifurcata) is an unusual palm that's grown as an ornamental throughout southern Florida. The foxtail palm is extremely hardy, growing in a range of soil types so long as they're well drained. It should be grown in full sun, and though the tree is quite tolerant, it can benefit from deep watering in the summer months. The large hanging clusters of brilliant red berries are one of the tree's strongest ornamental features.